Data Management is the foundation for a successful IFRS 17 and IFRS 9 implementation. Capgemini Invent offers the necessary tools and experience to tackle this challenge. As mentioned in our first blog “IFRS 17 and IFRS 9 – Two standards linked to each other shaping the insurance sector”, the simultaneous implementation of two new standards will create fundamental challenges for the financial reporting of insurance companies. The joint usage of market and valuation data – requiring early data harmonization between IFRS 9 and IFRS 17. Data Quality Management which should lie at the heart of both IFRS programs. A good DQ framework establishes clear procedures to continuously improve data quality (e.g. DMAIC). In this context, it is important to understand and define all (newly) required data elements by both standards and align them with all departments using them. This way, different data interpretations due to missing or differing data definitions (e.g. regarding effective interest rate, notional amount) can be avoided. Data quality is crucial given the increase in data requirements, e.g. related to contract analysis. DQ management from the start further improves groupwide efficient data collection by providing clear guidelines (e.g. data dictionary, data quality requirements, update frequencies, data formats) and by establishing a golden data source, i.e. a leading centralized data system, when information can be retrieved from multiple systems (e.g. rating information). In addition, DQ management includes implementing data quality checks and correction mechanisms to avoid false subsequent accounting, risk and actuary measurements (e.g. interest rates can be delivered as percentages or decimal figures). Centralized data architecture which helps to reduce redundancies while ensuring that the same data is used across your organization and only required data are collected while redundant or poor data are diminished. Especially the management of the contractual service margin (CSM) in IFRS 17 will be facilitated. As a key value, the CSM requires close alignment between actuaries (who calculate the CSM) and accountants (who need this crucial information in their accounts e.g. for financial consolidation). A centralized data architecture with connected systems (i.e. between actuarial and accounting systems) is the key to avoid discrepancies and inconsistencies in the data. Ensure a good reputation with internal and external stakeholders since reliable data are the foundation of management and investor decisions, builds up trust and paves the way for a successful company’s future. 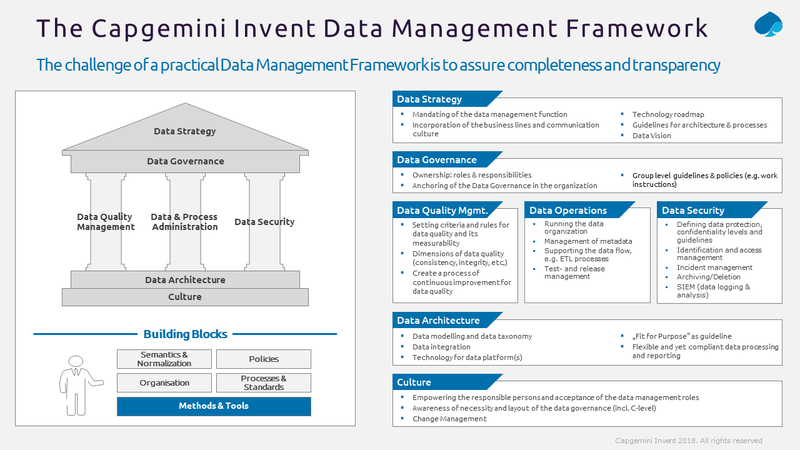 With the Capgemini Invent Data Management framework (see Graphic), Capgemini Invent offers a wide range of data management tools and methods and has developed a deep knowledge and experience in data management projects as well as compliance driven projects, like the implementation of IFRS 9 and IFRS 17. Our offerings and project experience in data management combined with our agile transformation approach (also see our first IFRS 17 blog) as well as cooperation models with IFRS 17 tool vendors will enable you to gain multiple benefits and raise synergies beyond compliance. In the beginning, we suggest Quick Checks regarding the impact of IFRS 9 and IFRS 17 for your company as well as a fit gap analysis of the existing data management systems to get an overview of the As-Is situation, gaps and challenges and to build a roadmap of data management-based implementation of IFRS 9 and IFRS 17. If you do not just merely fulfill regulatory and accounting requirements but use the opportunity to improve your IT infrastructure and change the way you handle your data, you will be prepared for the digital future.